Parents/caregivers and toddlers enjoy music and movement together on Thursday mornings at 10am in the church hall (71 Woburn Road, Lower Hutt). The sessions run for about an hour. Chirping Cherubs does not operate during the school holidays. Check out our calendar for session dates. Chirping Cherubs is a musical playgroup for parents, care-givers and young children from birth to 5 years. It is supported by St James’ church which provides the venue and the ‘staff’ for the setting up, the registration of families and the provision of morning tea, and the musical leadership. OUR PURPOSE is to provide a weekly programme supporting parents and children in the joyous, messy, noisy process of making music together. Parents will learn fingerplays, songs and games to share with their children, and make contact with other parents in a supportive network. We introduce children to ‘real’ musical instruments as well as the usual percussion and props. We aim to sing a lot, with voice warm-ups and breathing games, we move to the music developing rhythm skills and we play a range of instruments and games that require listening and co-operating. Our music session begins at 10am and we plan for around 40 minutes of music. This is followed by a morning tea for children (water, crackers and fruit) and coffee, tea and biscuits for the grown-ups, and a playtime. We encourage new participants to come and see us any Thursday in term time, and we need a team of people to support the activities. There are many academic papers that attest to the value of music in the development of human beings. (A bibliography can be provided if you would like to follow this up.) 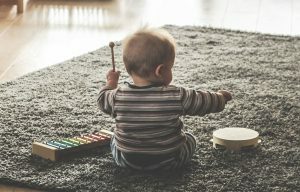 Engaging in musical activities: singing, playing instruments, moving to music and learning to listen helps develop the brain, forges links between people, assists in the development of physical and mental skills, and helps to stimulate, or to calm, soothe and relax – both children and parents! Through music-making in a group we can help our children to establish patterns and behaviours, learn turn-taking and focus, and develop a life-long interest in the arts. Contact Kasia to find out more.